The barn is a Grade II listed building and was probably built some years before its appearance on this Surrey village's Tithe map of c.1846. 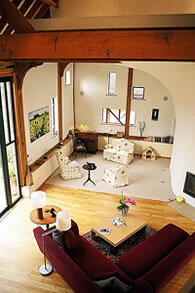 It was originally used as a threshing barn and is the main building within a farm development. The barn measures 16m x 9m x 4.5m in height, and was constructed mainly of softwood – frequently with carpenters' marks – over machine-cut oak wall frames and a brick base. The building is divided into a total of six bays, the easternmost previously containing a root store and probable hayloft. Externally the barn was weather-boarded, with an original full-height brick wall at the eastern end and a half-hipped tiled roof. The original timber threshing floor and its supports had been entirely replaced, but much of the structure remained intact. The roof is generally constructed with raking 'queen posts' set between the tie beams and a lower line of clasped purlins. A notable feature is the hanging knee braces, probably of elm, which support the tie beams. From the outset the clients, Philip and Angela, realised this was going to be a complicated project since the barn was a listed building, on green belt land, in an area of outstanding natural beauty (AONB). The clients also had to make a case for the domestic use of the building as opposed to light commercial – a primary consideration for restoration of agricultural buildings. A professional planning consultant helped them to formulate the arguments as to why a business would not be appropriate for the tiny village, particularly with its inherent parking problems. The subsequent planning consent still carried with it a strict requirement for an archaeological watching brief and for detailed plans of the future garden landscaping to be submitted, before any development even began! Philip and Angela wanted an open contemporary living space which would maintain the agricultural feel of the building and mean that the large central space of the barn could be retained. After the initial design was completed and planning consent secured by Damian Blower, the clients approached Elspeth Beard to realise their vision and carry out all the detailed design work as the project architect. The design has created a home whose historic roots are not disguised but complemented by the sculpted forms and living spaces placed within it. The design also anticipated restrictions that often go hand in hand with buildings on green belt land in an area of outstanding natural beauty, for example on the amount of glass used and the requirement to provide a sympathetic garden lay out. There is a deliberate contrast between the new curved living areas, fondly named the 'pods', and the historic timber structure. These pods are suspended either side of the huge barn space and are linked by a seemingly 'floating' walkway. The original look of the exterior of the building has been largely maintained and the only significant changes are the new windows and doors. 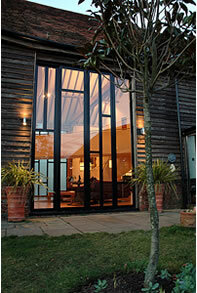 The windows were carefully placed to ensure that the existing timber frame of the building was not altered in any way. In one location the existing timber frame of the building cuts through the new window but the frame was retained and simply glazed around. All the support spaces are discreetly tucked away so that the entire central space is almost totally open-plan. 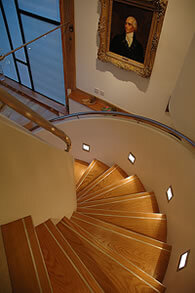 After planning had been approved EBA became involved to produce the detail design and become the project architect. The project involved the restoration and up-grading of the existing building fabric of the barn and stables and at the same time the conversion of the buildings into a new residence. The barn had to be stripped right back to its original frame. The condition of the weatherboarding was reasonably good on the north side but had started to deteriorate on the south and western sides due to the prevailing weather. The weatherboarding was carefully removed ensuring minimal damage to the existing structural frame of the barn. Although much of the frame was in remarkably good condition there was woodworm in many areas. In order to comply with the building regulations the walls and roof required insulation. It was decided to insulate between the existing timber framing, keeping the main oak timber posts exposed within the main living spaces. Areas of the timber frame were rotten and sections were cut out and replaced but this was kept to a minimum in order to retain as much of the original building fabric as possible. The building construction took 36 weeks, beginning in May 2002; although the barn was generally in good condition many of the existing walls and timber posts required underpinning to accommodate the new loads. The five main trusses required strengthening as these support the new floors at either end of the barn. This was achieved by a system of “goal posts” with steel plates sandwiched with new timber, but all the existing timbers were retained. A new cantilevered steel frame was constructed at the eastern end of the barn to support the new bedrooms and bathroom. The walkway was constructed out of steel channels supported either end and tied to the central truss with stainless steel tie-rods. The original stable building now forms the kitchen area but this required rebuilding because there were no foundations and the wall was structurally unstable. The existing building was carefully taken down and completely rebuilt using all the existing materials reclaimed from the original stable and cart shed. The existing roof and walls were stripped back, insulated and re-clad in order to achieve a high thermal performance, which was very important to Philip and Angela. The building is very highly serviced with computer cabling throughout to achieve technological “future proofing”. Lighting, computers, TV, audio, heating and air quality are all networked. The detailed design and contemporary finishes were carefully considered to enhance the contrast between the existing old building and the addition of a modern interior. Despite their passion for technology Philip and Angela are committed to an organic and chemical-free lifestyle, which proved testing when sourcing appropriate materials such as paints, wood treatments and carpets. They managed to find suppliers for most items and have even limited their use of processed water by installing a rainwater harvesting system. The Threshing Barn has won three awards: Surrey Historic Buildings Trust (2002), Waverley Design Awards, Environmental Design (2003), and Waverley Design Awards, Alterations and Conversions (2003). With only three months to produce the working drawings and oversee the majority of the build (I was helping to organise a round-the-world bike trip, mid-project) the presence of a camera crew could have been an added stress! In reality it has provided a wonderful pictorial record of the project and at the time it helped to secure prompt deliveries from suppliers. The programme was broadcast in Series 3, February 2003 and is soon to be made available on DVD. 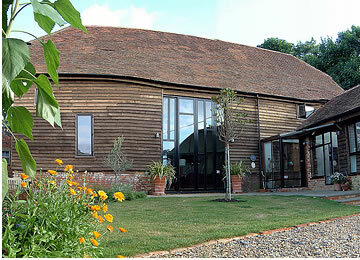 When the Grand Designs Magazine was launched in 2004 the Threshing Barn took pride of place on the front cover. Click here to view published articles about The Threshing Barn project.